This is the second in a series of six posts, Know Thyself, dedicated to stepmothers everywhere who need extra support as we navigate the sticky situations of holiday gatherings. Our goal is not to magically make life happy, but rather to interrupt our feelings of worry, fear, or frustration long enough to make choices that fit our situation and needs. It’s ideal if you can suspend judgment about what you find in your observations and be willing to stay with it when it seems like nothing is happening. Find a place to sit, stand, or lie down. First, reflect on your observations of your breathing from the activity last week. Is it easier to track your breathing now? Can you tell that the breath causes movement in your back, on the sides of your torso along the ribs, and in your chest and abdominal area? Can you tell when you are breathing in shallowly and when the inhalation is deep? Now, shift your attention to your spine. Think of the length of your spine and how it is shaped. Are there curves in your spine? At the neck? At the lower back? What about a rounding in the upper back, do you have a sense of falling in your chest in such a way your shoulders round forward? Do you have pain at any point along the spine? How significant is the discomfort? What do you believe to be true about posture? Do you think slumping is bad? Do you think your shoulders should be thrown back and your stomach pulled in? How long can you stand or sit in any one pose before you have to move and adjust to be comfortable? Pay attention to the curves you noticed in your spine? Do something to deepen the curves just a small amount? Please go gently and don’t move so far you cause discomfort. Now, experiment and see if there is something you can do to decrease the curves, again, very gently. Go back and forth between deepening the curves and diminishing the curves. Make the distance smaller and smaller in each direction until you are not moving, but have come to rest in what we might call neutral. How close is that neutral posture to the posture you normally carry? 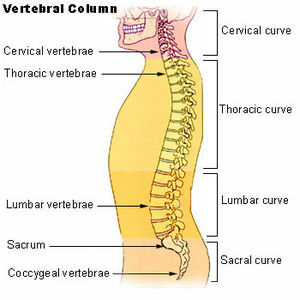 When you are out and about in your life, catch yourself and take note of the shape of your spine. If you can, just watch for a few seconds before you make an adjustment to what you think it should be. In fact, each time you find yourself in a posture you don’t like, rather than immediately moving to match the image of what you think you should be doing, just wait and take in even more of the picture. How long is the front of you? How long is the back of you? Are you comfortable? When you know the answers to these questions, then feel free to adjust to something else and go on about breathing and living and noticing the shape of your spine. Each time you find yourself in a challenging situation or a conversation that feels risky, take note of the shape of your spine. Are there any patterns you can find? Do you hunch your shoulders when you are worried? What do you do with your spine when you feel challenged? Defeated? Are there degrees of slumping and being upright? Can you experiment with the middle, not slumping and not upright? Incorporate these kinds of noticing into your daily experience, while you wait in line at the checkout, while you sit at a stop light, while you stand at the kitchen sink, or brush your teeth. Don’t worry about spending hours and hours studying yourself, try to fit the observations in here and there so the sequence is simple and fairly brief, just a question, a noticing, and a move on to the next thing. Do this as often as you can remember. For this week, that is enough. This entry was posted in Education, How-To and Education, Reflections on Stepmothering and tagged breath, Fitness, Health, Muscle, Poor posture, Posture, Vertebral column. Bookmark the permalink.